A processor with virtualization technology, AMD-V or Intel VT-x capable. I’m not sure if it is technically required but it certainly helps. Lots of Ram and disk space. iPC is one of many “distributions” of OS X for non-Apple computers. Check the iPC site for more information on using it. You won’t find any download there though, you’ll have to find a more creative source. First create an image file to hold the installation. This creates a 20 GB image file osx.img in raw format. Specify more GBs if you will want more space but I wouldn’t do any less then 10GB. Start Qemu with the new image file and your installation ISO. This will start qemu in 64 bit mode. “-hda osx.img” should be the name of the image file you created above. “-cdrom iPC\ OSx86\ 10.5.6\ Universal\ PPF5\ \(Final\).iso” should be the full path to your installation iso. “-m 2048” is how many megabytes of memory you want to make available to the system. 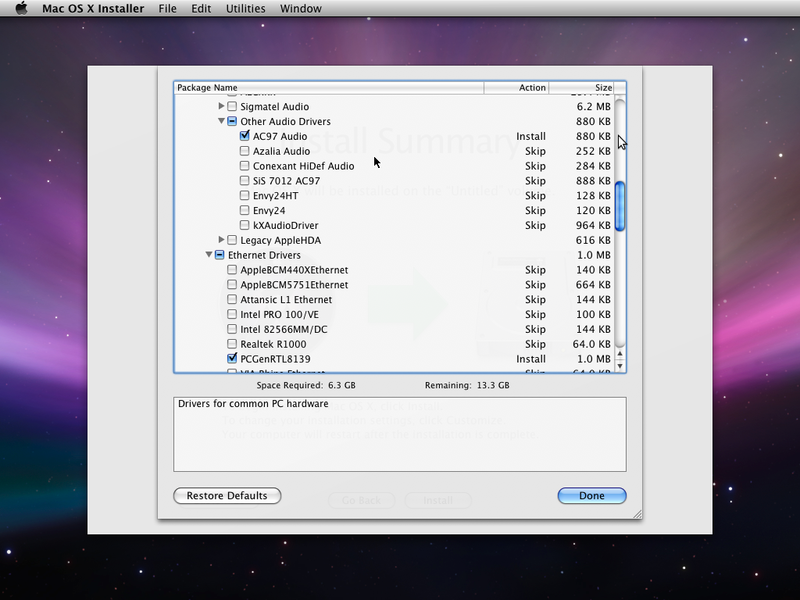 “-soundhw ac97” is used to emulate the ac97 sound card which is supported by OSX. “-boot d” is used to tell the system to boot of the cdrom first. If you don’t and it just stalls at the Apple logo. Try using F8 and then -v to startup with diagnostic messages. That might give you some clues as to what’s going on. Click next and continue. Then accept the software agreement. 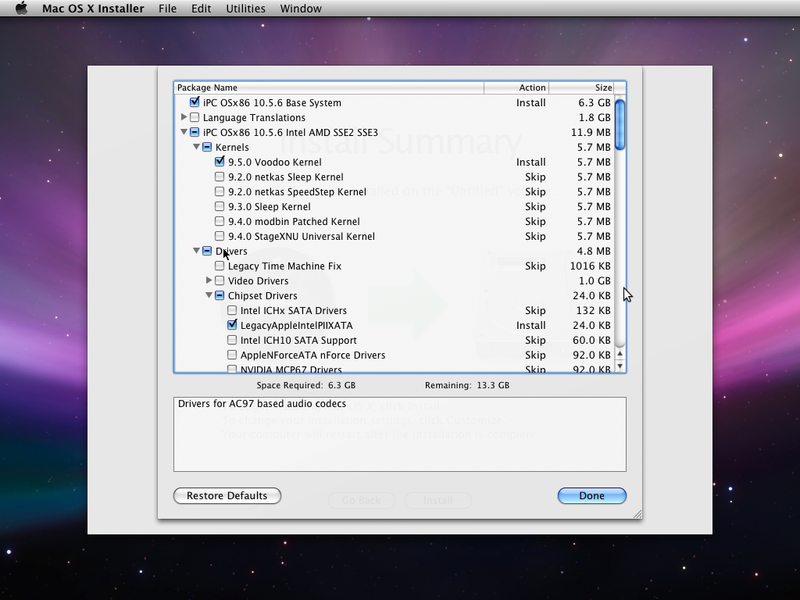 Then it asks, “Where do you want to install Mac OS X?” and gives you a blank list of possible installation locations. This is because the image file has not yet been formated. Choose “Utilities” from the top and “Disk Utility”. 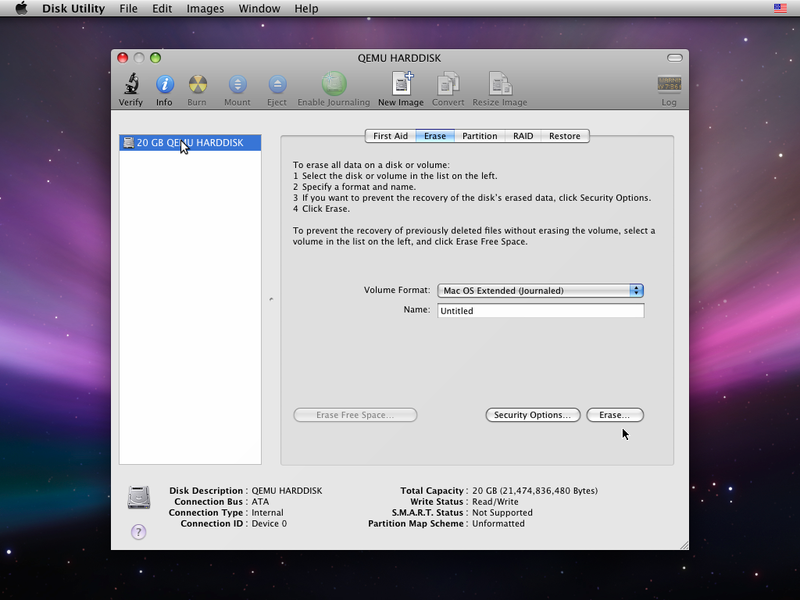 Select “QEMU HARDDISK”, choose “erase” from the top and click the “erase” button twice. The disk image is now formatted so close the Disk Utility. You should not have a destination avaliable to install OS X too. Select it and click “continue”. It is very important that you customize the installation on the next screen so you can install the proper drivers. It’s very important that you select the 9.5.0 Voodoo Kernel or you will be unable to boot your new system. You will need the LegacyAppleIntelPIIXATA under chipset drivers or your hard drive will not work. For audio drivers select AC97 Audio which is under Other Audio Drivers. For Ethernet select PCGENRTL8139. If you want to try to get usb to work you will need the Patched USB drivers. Also the responsiveness of the mouse and keyboard can be improved by selecting the PS/2 Keyboard FIX under the fixes section. Click “Done” and “Install”. Then in about 20 minutes you should have a working OS X installation. Upon reboot you get a welcome screen asking for the region your in. The rest of the setup is pretty straight forward. You don’t have to register with Apple. Be sure to choose DHCP for network setup. Upon completion you’ll see the beautiful Leopard desktop. The magic here is the “-no-kvm-irqchip” which disables a certain accelleration function that causes problems with networking being very slow in OS X. “model=rtl8139” is chosen because that’s what we selected during installation. “-smb $HOME” is used to allow file transfers between the host and guest operating system. To share files open finder. Choose Connect to Server… from the “go” menu. Enter “smb://10.0.2.2” in the server address. Choose “Connect as Guest”. Choose a volume and then it should mount it on the left side of the finder. If sound doesn’t work try installing the following updated driver. If you want to take advantage multiple cores you can use the option “-smp 3” which tells qemu to make 3 cores available to the guest machine. Occasionally the system crashes. It seems to happen most often when I’m downloading large files such as Xcode. Fantastic – thanks for posting this. I’ve spent about a week trying to get things to work and in the end your instructions were bang-on. Thanks for the work figuring out how to get networking sorted too.